The Beautiful town of Interlaken can be found nestled between Lake Thun and Lake Brienz in the mountain region of Bernese Oberland. Surrounded by glittering lakes, alpine meadows and spectacular glaciers, Interlaken is the perfect backdrop for any holiday snaps. An ideal base to take in everything Switzerland has to offer, try your hand at skiing, hiking or cycling for an active getaway. Or if a relaxing break is more your speed, take in museums, explore picturesque villages or simply unwind at a relaxing spa. Interlaken An attractive spa town, set between Lake Thun and Lake Brienz and overlooked by the three peaks of the Eiger, Mönch and Jungfrau mountains. The activities on offer include trips on historic paddle steamers. The 72 Waterfalls The waterfalls of the Lauterbrunnen Valley include the immensely powerful subterranean Trümmelbach Falls, reached by a funicular railway inside the mountain, and the romantic Staubbach Falls. The valley is a nature conservation area and guided hikes are available. St. Beatus Caves A huge system of underground limestone formations and gorges of which about a kilometre is accessible along well-lit pathways. There’s also a museum where you can find out about cave science and the history of cave exploration. St Beatus is said to have killed a dragon here and his grave is still a site of pilgrimage. 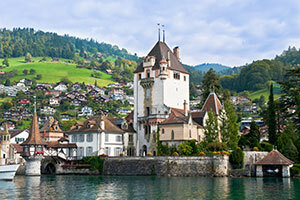 Oberhofen Visit the picture book lakeside castle and gardens and admire the amazing timepices and music boxes in the Museum of Clocks and Mechanical Musical Instruments. Jungfrau Railway This iconic railway winds upwards through beautiful scenery and a huge tunnel to the Jungfraujoch, highest station in Europe. The views are incredible and a visit to the Ice Palace cut into the glacier is included with your rail ticket. Ballenberg Open Air Museum In the reconstructed houses and farm buildings you can catch a glimpse of Swiss rural life in the past, including old crafts and customs. See old varieties of plants and native farm animals, and eat in the restaurants or have a barbeque in the picnic area – wood is provided. To find your perfect campsite in the Interlaken please use our interactive site finder, call our knowledgeable customer advice team on 01 242 1901, or go straight to the individual campsite pages.